therefore especially useful for treatment of bacterial respiratory infections. 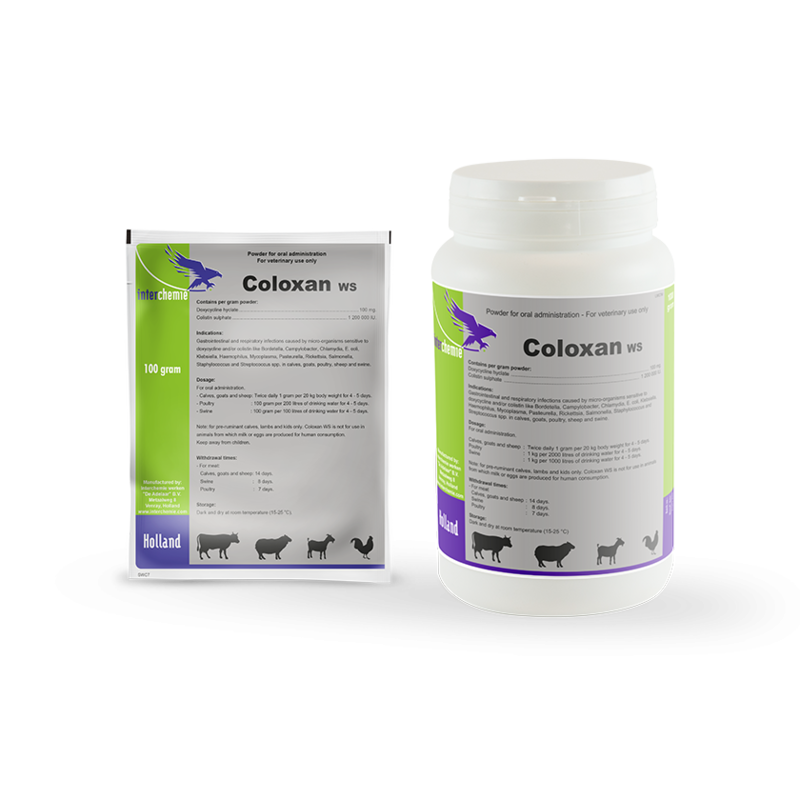 Colistin is an antibiotic from the group of polymyxins with bactericidal action against mainly Gram-negative bacteria like E. coli, Haemophilus and Salmonella spp. Polymyxins interact strongly with phospholipids and penetrate into and disrupt the structure of cell membranes. Administered orally, colistin is poorly resorbed and, therefore, performs its action predominantly gastrointestinally. Gastrointestinal and respiratory infections caused by micro-organisms sensitive to doxycycline and/or colistin like Bordetella, Campylobacter, Chlamydia, E. coli, Klebsiella, Haemophilus, Mycoplasma, Pasteurella, Rickettsia, Salmonella, Staphylococcus and Streptococcus spp. in calves, goats, poultry, sheep and swine. Hypersensitivity to tetracyclines and/or polymyxins. Administration to animals with seriously impaired renal and/or hepatic functions, animals with an active microbial digestion or animals producing milk or eggs for human consumption. Concurrent administration of penicillins, cephalosporins, quinolones and cycloserine. Discoloration of teeth in young animals or hypersensitivity reactions may occur. Digestive alterations may appear, such as intestinal dysbiosis, accumulation of gases or mild diarrhoea. Twice daily 1 g per 20 kg body weight for 4 - 5 days. 1 kg per 2000 litres of drinking water for 4 - 5 days. 1 kg per 1000 litres of drinking water for 4 - 5 days. Note: for pre-ruminant calves, lambs and kids only. Doxycol WS is not for use in animals from which milk or eggs are produced for human consumption. Calves, goats and sheep : 14 days. Sachet of 100 g and jar of 1000 g.